Well another great product that over delivers by Brendan Mace and Jono Armstrong. Welcome to my Profit Maximizes Review, we will take a quick look inside the members area and go over the pricing structure including the upsells. Profit maximizers is based around the proven concept of giving away bonuses when doing an affiliate product promotion. This method has proven itself to increase the conversion rates of you affiliate marketing campaigns because you increase the perceived value of the product you are promoting. 80 “Done For You” products that can be given away as bonuses or use the training to gain a huge advantage on your competitors . OTO 1: $67 -down sell $37 – Triple your commissions. Training on exactly how to use these bonuses to maximize conversions on your sales. OTO 2: $47 — This is a collection of conversion boosters that will massively increase value. OTO 3: $197 — Limitless traffic. Let’s you place a tracking pixel on Brendan and Jono’s salepages, so you can use re targeting campaigns. OTO 4 : $37 — Done For You Bonus Pages. Get monthly campaigns from Brendan and Jono. This is a “one time” payment, no recurring fees whatsoever. OTO 5: $97 — License Rights to Profit Maximizes. 100% Commissions on the entire funnel, sell it like you own it . Inside the members area you will find an easy to navigate dash where you can access the bonuses and training modules . There is a good variety of bonuses that will save you a ton of time instead of creating your own bonuses. Brendan and Jono have included training so you can start faster. The OTO #3 well expensive, is a super valuable tool. They will teach you how to re target people who have visited the sales pages of their products. This is achieved by placing a tracking pixel on all of their future sales pages. I personally have this feature and it really does work to create custom audiences to target with ad campaigns. It is possible that everyone who purchases this product will be giving away the same bonuses. Mind you there are 80 to choose from so chances are slim that everyone will choose the same as you . Who is Profit maximizers For? Anyone that wants to increase the value of the products they are currently promoting will find value in this product. The other possibility is you can actually just buy Profit Maximizes and use the bonuses for personal training. Believe me there is a ton of valuable information and training in them. This is another great product by Jono and Brendan. It is very affordable and can add an extra boost to anyone who does affiliate marketing in the Make Money Online niche. I think the best part is that you can purchase the product and start using it immediately in your campaigns. What Is The Profit Maximizers? Inside the Profit Maximizer, you get 40+ of our highest-quality bonuses that you can use right away to start making money. No “tech” skills or prior experience required to use these. We’ve intentionally made it super simple for anyone, even newbies, to take this and start using them to make a lot of money. This might actually come in handy for me. It’s nice to have bonuses like these already put together, instead of having to rack my brain coming up with something new all the time. Since I’m still fairly new to affiliate marketing, I have enough to figure out already. I also like that you can just use some of these as your own training, too. I’ll have to give this some serious thought. Thanks for sharing! Thanks for your comment Mark , yes this is an amazing product that can save you a whole bunch of time , plus the bonuses they have put together are actually very informative and can help any one that wants to use one of the methods to generate income. 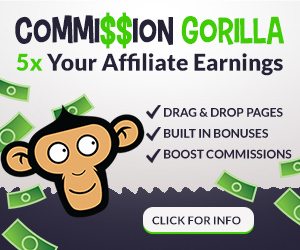 If you are interested n an way to create stunning bonus pages check out commission gorilla here, they are running a 50% OFF CAMPAGIN RIGHT NOW . . this makes the whole process of offering bonuses a no brainer . I appreciate this. I agree with you, giving out bonuses increase conversion especially if visitors to your site consider the bonus something of value. This is a secret every affiliate marketer needs to key in to experience more conversion.I learning of the Profit maximizers for the first time and I’m amazed by the number of bonuses they are giving away. The bonuses are valuable stuff useful for online entrepreneurs. The sign up is a good bargain compared to the bonuses. The good part is there is no risk involved as the company has promised a 30 day’s money-back guarantee. Hi, I actually like your idea but the thing is I don’t deal with things like this but nevertheless that doesn’t me i can’t promote your article, i have colleagues who are into full time business, I will refer them to see this if they can actually make use of it, nice article, keep it up. Hi Destiny , sure that would be great just forward your friends the link to my review.I would appreciate the share . Have a great day ! !